This feature known only as “Natural Arch” is carved out of Palliser limestone on the southwest slope of Mount Perce in the Canadian Rockies. 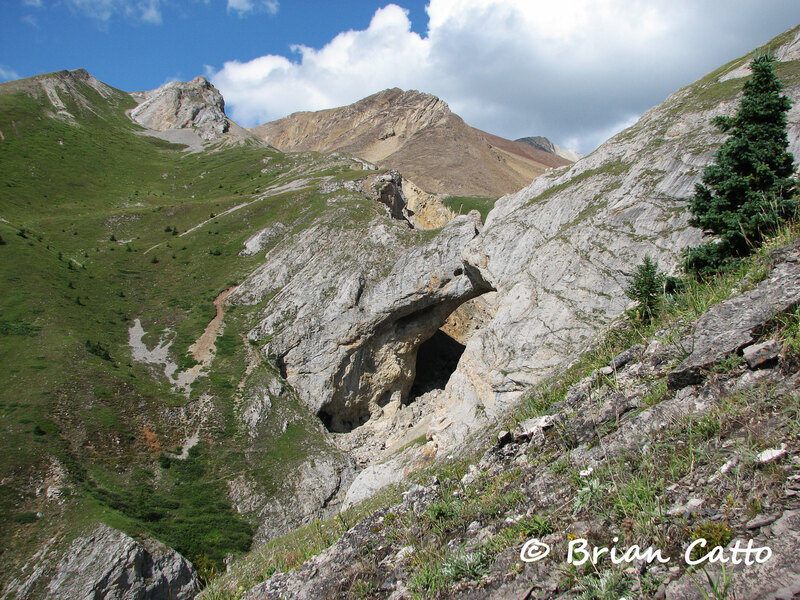 The arch is located along the upper reaches of Blue Creek in northern Jasper National Park. These photos and most of the information is courtesy of Brian Catto. The coordinates are 11U 375960 5922070 (or at least very close) and our best estimate of the span from analysis of Brian’s photos is 150 plus or minus 15 feet. The photo below is taken near Caribou Inn Hiker Camp, the closest hiker campground to the arch. There is a horse camp called Natural Arch right at the base of the slope below the arch, but the arch cannot been seen from the horse camp. Brian climbed up near the arch and a closer photo is below. 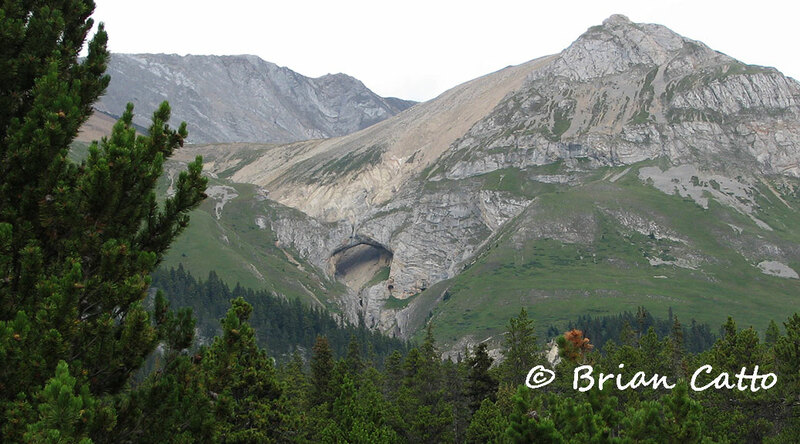 If you click for the larger version you can see two mountain goats on top of the arch (upper right of the opening). The shortest route to the arch involves 40 miles of trail one-way from Rock Lake using the Willow Creek, North Boundary, and Blue Creek trails. The trails are open to hikers and horseback riders. 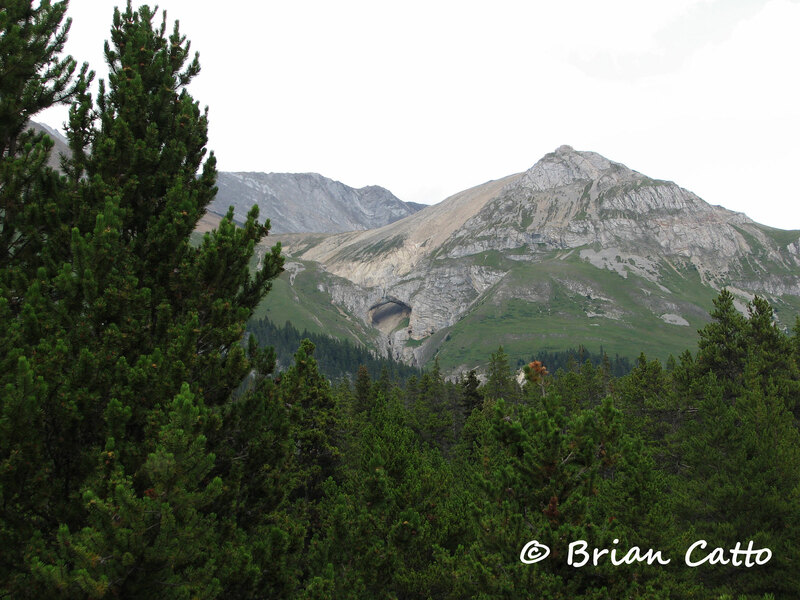 Brian hiked in but reported that he thought the horse camps were nicer than the hikers camps. A backcountry camping permit is required from the Jasper National Park trail office.